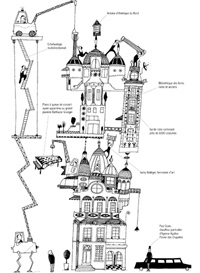 In this charming illustrated tale, two competing neighbours begin embellishing their houses, only to find themselves caught up in a race to build the tallest, most decadent skyscraper featuring solid gold doors, diamond-encrusted pillars, grand ballrooms, expensive paintings, live tigers, and indoor swimming pools—with consequences inevitable, and not. 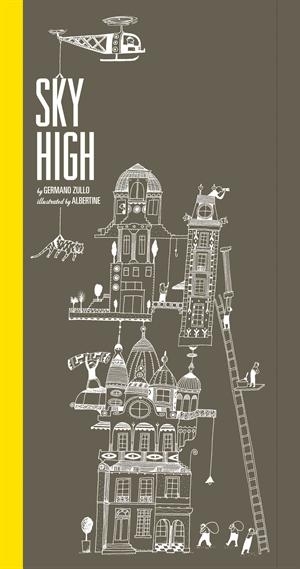 Kids will love spotting the funny details hidden in this witty take on an age-old moral, while their parents—particularly any who've ever undertaken a remodel—will chuckle with recognition. A couple of days ago I talked about a book that was slightly taller than most novels, well this picture book is most definitely taller than a normal picture book, it’s actually 36.8cm tall, so that really does mean it probably won’t fit on your library shelf! Again, I will say, don’t let the size put you off, when you have a closer look you will see that this book HAD to be the size that it is, otherwise it wouldn’t have been quite so special. Not only is this book unlike others because of its size, it’s also quite different in terms of content. It’s not a wordless book, however the text is not written as a narrative. The only text in the book is in the form of labels refereeing to parts of the building and the occasional dialogue from the owners/builders. So, it’s not necessarily a book you will ‘read’ as such, but one you will spend a long time pouring over, and you will undoubtedly uncover something new each time you look at it. At the beginning of the book we have two normal looking, nice houses. 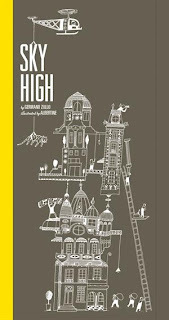 With the turn of each page the houses grow, higher and higher, becoming more extravagant with each level. As I mentioned earlier there are labels pointing out the various extravagances, such as a wave pool, wardrobe containing 6,000 suits, a North American oak tree, 4,275 years old and a hanging garden to name a few. As the houses have reached just about as high as they can go, there is only one more thing to add, and that is a flag at the top of the building. For one of the men, this is the ‘straw that broke the camels back’ and the house collapses, the man with the house still standing, decides that his flag, doesn’t have to be at the very top after all! The last few pages are particularly funny, when the owner of the only house standing, orders a pizza. When the pizza is delivered, the pizza delivery girl is given a long lost of directions, so that she is able to find her way to the top of the house, she considers this too hard, so she leaves the pizza on the doorstep. A wandering pig happens upon it, and can’t believe its luck, as it takes the pizza home to share with the family! Germano Zullo is an author and poet who lives in Geneva, Switzerland. Albertine has contributed illustration to numerous books. She teaches at the School of Visual Arts in Geneva.